Hydro-Force Professional Leather Protector protects leather from staining, soiling, cracking and premature aging, by providing a protective guard to the surface of the leather as well as the essential oils and lubrication that it needs to remain soft and supple. A simple "Wipe-On" application penetrates easily into the fibers of leather providing a protective barrier between the leather and foreign spilled material such as oils, liquids, alcohol, normal dirt and soiling and much more. This barrier makes regular cleaning and maintenance much easier while keeping the leather looking like new. 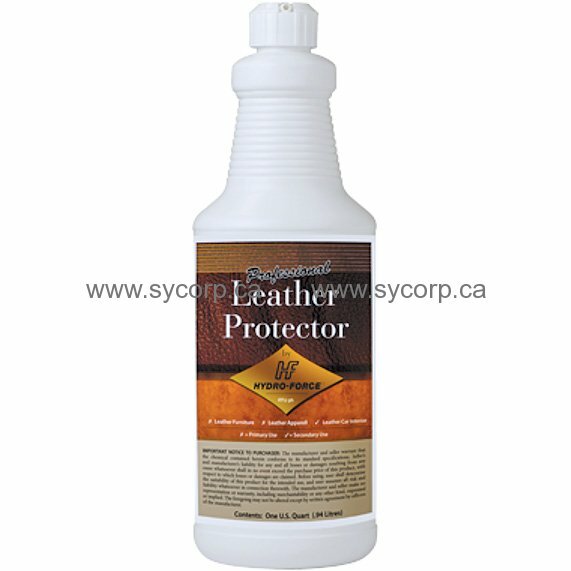 Hydro-Force Professional Leather Protector protects against most water and oil based common household food and beverage spills. It also protects your leather investment against harsher spills and gives the furniture owner more time to remove them before any permanent discoloration is done. It protects and extends the investment in fine leather furniture, but and can also be safely and effectively used on auto leather, leather jackets, luggage, handbags, and more.